Share from Manifesting Call attendee "Thank you Thank you Thank you, Law of Abundance and DaKara. This month we manifested a win from our favorite radio station...a weekend trip to Palm Springs, $100 restaurant coupon and a show at a casino to see an Elvis impersonator. I was so excited. Great win!!! My husband Joe finally put in an ad for an assistant. He'd been talking about this all year. So, he put up his ad and got so may replies. The first one was exactly what he was creating as he thought about what he wanted in an assistant. Exactly what he wanted. Ah, the Universe is generous and loving. It's been a great month. xoxoxo Carole, Los Angeles, CA"
details on this months class and meditation! New Moon checks and when to release them! Timing is important to this process! for different area’s of your life each month! Wait.. there are no limits! Testimonials and Shares of Manifestation!!! The symbols are beautiful..cannot wait to write it on my checks. Where do we write the dollar amount ? Do we write anything in the memo line? On the memo line – write what you are wanting… the end result. a snapshot in a few word description. On the back of the check sign it… and then list more details of what you are wanting. exterior, interior, and any extras you would want in the vehicle. ie heated seats etc. what is the difference between the green and purple checks? hi Pamela… best to write checks only for yourself, unless you have permission from others. For the most power, it should be the person giving their own intention and energy. Thank you for sharing this with us all . Been writing my new moon abundance check for the last 2 new moons . If the intention on the check is partially fulfilled, do you burn it on the full moon and rewrite a new one again on the new moon? hi Deb… yes… if partially fulfilled, burn and write new check. Perhaps shift your perspective a little bit to support full manifestation. Can I use these checks to manifest a new love? Or a new job? I am looking for a new full time job and /or a new love. What can be the best way to write on check? Putting all my trust in this, I need you abundance! hi Kasey… yes… you can write checks for any areas of your life! For Love – write on memo line (something like) New Love or Ideal Relationship or Soul Mate. Then write the details of what attributes match that statement… this is for any area of life. You can also make a separate “list” in alignment with what you are writing a check for, creating a story of what being present with the _____ is. So I am writing my very first check tonight. When do I burn the heck? hi Paige… checks are released at Full Moon. I will send timing for release out to the email list. I meant this past new moon, my stones go out on the full moon. I also burned some very old “male energy” in hopes of creating better energy with my man of 8 years. We seem to be stuck and I was told by the cards that there was old male energy that had to go. I forgot it was there until she told me where to look. I hope the abundance checks will also help. Again, thank you. hi May… space clearing is a great suggestion to those who have not thought about it. Energy can become very stagnate in any space… including our cars… good to smudge or clear your vehicle as well. Another important note is to clear clutter from your space. Then smudge. Clutter can have a profound blocking ability! Feng Shui, the ancient art of energy can also support your manifesting. Visit http://www.FengShuiMind.info for access to a free call on my program for clearing your inner and outer worlds. Filomena, focus on what you do want vs what you do not want. Manifesting happens from the inside out. If you are unhappy in some area of your life, shift that, then ask for what you want. Happiness attracts Happiness… the same is true with what we don’t want in our lives. However I do not think you saw them. I know you addressed this yesterday on the call a little bit but I still need some clarification please. I release 2 more long term checks at the full moon but of course I’m still waiting for the manifestation. Should I rewrite them again this new moon? Also how long do I keep them? Shall I keep them until I want to add something or until my intention manifests? hi Joanne… thank you for joining the call! I am sorry.. I did not see your questions… Using the new system was somewhat easy, but I will have to find out how to view questions written in the box. Yes… write new checks for the longer term items. You can hold them for several months, or release them when it feels right. Then write new checks with perhaps a deeper or different perspective. Writing new checks also adds fresh energy to the longer term goal. Always follow your heart. You may feel the checks should be left on your altar for a few months and then ‘something’ is prompting you to release them. When you write the next check(s) for that or similar wanting, see how it may ‘feel’ different or you how feel different about it. Allow this to be your guide in writing a new check. Thank you DaKara. That is very helpful. Help! The 3/pg is not working and I do not like the huge 1 per pg check. Can you correct that? Greetings Jasazil… I just tested the 3 up PDF. They are working. You will need Adobe Reader to open the PDF file. https://get.adobe.com/reader/ or some similar PDF reader. Thank you for this! Where do you store the check after you’ve written it? Keep it near me, in my purse, tape it on a wall in a specific area? Thank you so much. Great Site, hope law of abundance bestows its energy my way. you can see them. Remember to LET GO! for receiving abundance in your life while the check is burning. This is the first time am trying this. 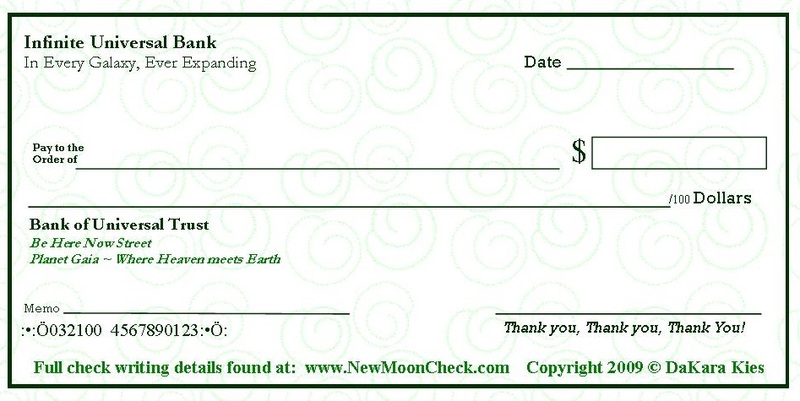 I printed enough checks for every month and entered the new moon dates in my calendar. I Hope to do this faithfully every month. I am grateful to you for sharing this information and excited! Thank you! Fabulous Jann… be sure to add your name to the email list to receive the best times to write and rele4ase your checks for added empowerment! pls madam am in Nigeria am 18yrs old…am interested in every stuff in dz website.. but I don’t have money… pls if u can write the magic check for me and make me rich ,powerful and intelligent… I swear with my life 2 serve the universal and announce u here in Nigeria…pls I wish u will appear 2 me so that we will talk…and enter into a covenant with u….thank u ma…. I have a question regarding these cheques, I am owed money by a couple of people to the amount of $110,000 . these people have said they will pay be back but have not it’s been about 12 years for one and 5 years for another, i do not know where they are thus cannot find them. Can I use these cheques to regain the money owed me by say a lottery win? should i write small amount cheues or put the full amount of $110,000? I was thinking of putting a full amount cheque on my vision board and writng several smaller cheques. thoughts ? I am in need for this money as i have had to pay a huge tax debt and have been out of work for the past 3 years. i have done a course in massage therapy and am doing my best to find work. i have also registered a business for myself as a mobile massae therapist but it is slow. Greetings Roberto… write a check to “Claim Money that is yours with Interest, this or something more”. Do I put the “Claim Money that is mine with Interest, this or something more” in the pay in the order of …. part or the memo part of the “Infinate Universal Bank” ckeck? Do I write ” now” in the date area? I have been very patient but now I am desparate for it as i am struggling. I am also very open to recieving what is owed me. Thanks for you reply again. I have let go of the persons returning me the money already as i know that will not happen. I trust the UNIVERSE to provide what I need from other sources. I will have to wait for the next new noon in february as i missed this one. Bless and many thanks again for your wonderful advice. Thanks for the New Moon Check reminders, They are always an amazing journey! I have had so much abundance in so many surprising ways, that I am just in awe with gratitude. I have to say that there many blessings. So thanks for all the reminders and keeping things on schedule in such a beautiful way for me and my present, and future. Blessings to you DaKara as well. the checks have been magical! I may not have gotten rich in money, not yet at least lol. But the amount of abundance I receive has been nonstop. I am speechless. From dinner invites to receiving food from friends and gift cards, gifts, and just recently on thursday i received a text that my $1200 debt will be forgotten. Then on Friday i received a message that i won a contest! I entered every contest i can. I won tickets to nyc fashion week and giftcards for different vendors worth $500. Checks just show up in the mail and opportunities to make extra money just keep arriving. Last year i won a trip to california. And the list goes on. I am just blown away. I welcome all abundance and am grateful for everything that i receive and i truly believe that has a lot to do with it. Dont get me wrong i have alot of debt but i try to stay positive and open and i have a strong belief that everything will work out in time. I try to keep track of all the abundance i receive but i just cant keep up. I am starting a journal from this point on. It comes in soo many forms. Some months are slower but i guess the overwhelming months make up for it. Thank-you for the guidance you offer. I love receiving your newsletter and the reminders. I sometimes lose track of days so in essence you are kind of time grounding for me. I am blessed to have read the comments today as I was unaware of all the cheques could be used for, guess I had tunnel vision on financial abundance. This night I will utilize my new found knowledge and write one for healing. I know that I should not write a cheque of others but can I write one for healing of pets? Or have I misunderstood healing cheques? Bright Blessings DaKara. You mentioned that we have 24 to 48 hours to write out our new moon checks. New moon was on February 26th. It’s Febuary 28th. Can I still write out my check? Is the moon void of course? hi Linda… the most ideal time is 24-48 hours… yes now is a good time to write checks. I just sent out an email sharing you have until Wednesday March 1, 2017 at 6:18 pm PST to finish writing checks… then the moon moves void of course again. hi Nancy… to receive the best timing for writing and releasing checks, please subscribe to the mailing list. You can write your check anytime on Tuesday this month. Re your sign question. I doesn’t matter if you know the sign or house the new moon is touching. Although, knowing does gives you more power in writing your checks. If my country does not use dollar as currency can I use my country’s currency? Hi, I’ve been writing my checks for about 4 years now and as soon as I started my life has changed for the better. I’m always spreading the word that abundance is available for everyone ..some people think I’m crazy, and others are intrigued. I do believe one must have a certain mindset. Negativity or desperation won’t help you. I have been very blessed ( love, financial) it is not just luck my friends, these checks can make an enormous difference in your life. I’m going to continue writing them for the rest of my life. Your website has some very valuable tips- thank you. AWESOME! I just found your website from a Podcast I downloaded from LOA Magazine. Your interview with Jewels was awesome! I have been writing NEW MOON WISHES for quite a bit. I’m feeling the need to try something new and different; however I already wrote down my 10 New Moon wishes! Say it ain’t sooooo! I don’t want to spread my energy too thin. Is it possible to also write a check? Thank you for your AWESOMENESS and for sharing your gifts. hi Erika! I say yes to writing one check along with the wishes… I do believe it is pushing the limit, but Wishes and checks have a slightly different energy to them. for each wish/check written – to support clearing any energies holding one back from manifesting that particular hearts desire. hi Carolyn… please sign up on the mailing list to receive timing… there is a time converting link on the website and I include in the emails sent out. once you determine how many house ahead of Pacific Time you are you can easily convert the times for writing and releasing your checks. Thank you for this. Very effective. I wrote out my check for this month…but I wrote all my wants on the back of the check instead of making separate checks. Is this okay? I’ve been writing out abundance checks for nearly 2 years. Thank you very much for the abundance checks, along with your guidance and suggestions. They have really helped me. I’ve been writing checks for a couple of years now. I have written them in general terms of abundance and never for anything specifically. I didn’t recall that you could write out several checks each new moon. That’s awesome to know. I learned a lot from the comments too. I especially liked the space clearing suggestions. I have done saging, but never thought of things like clapping, etc. Speaking of space clearing, I recently came upon a similar type of clearing for not only one’s home, but especially for one’s self, environment, as well as from the effects of others and the effects from ourselves. 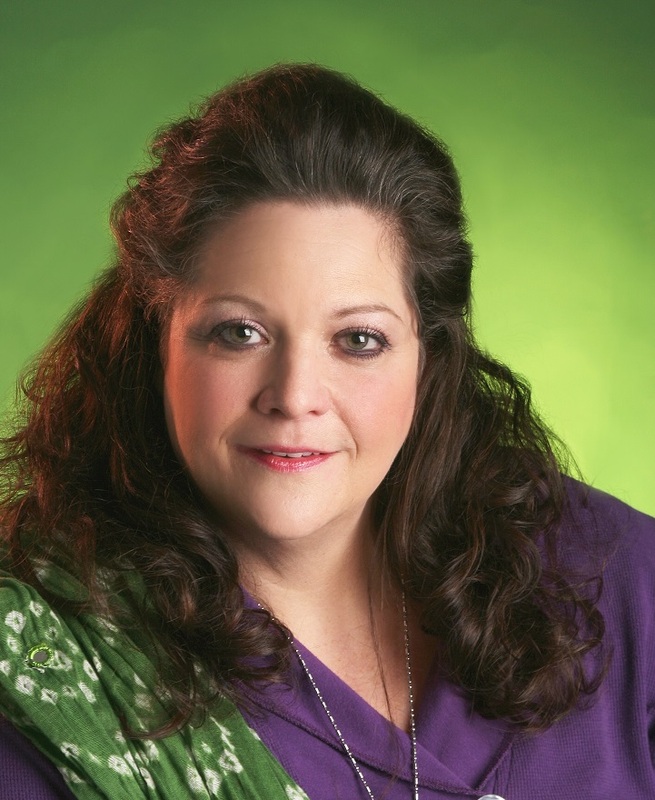 If anyone’s interested in checking it out, author Jean Haner has a new book out called, “Clear Home, Clear Heart.”. I would recommend checking out her YouTube videos first. She has about four webinars on the subject. That would be a good way to find out if this type of clearing resonates with oneself. I have been writing checks only 1 per new moon for 4 months. I need out of debt. My husband’s pest Control business has grown starting at 4% then 10% and this month 15% we are blown away. It works! 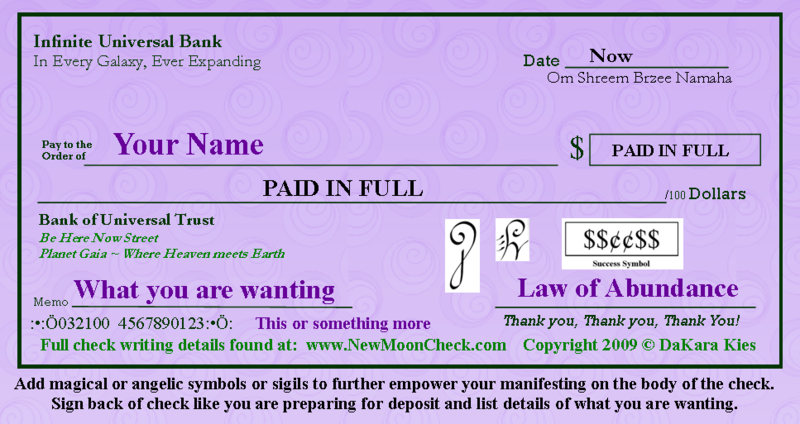 Thank you so much for sharing how using New Moon Manifesting Checks has helped your business grow! I appreciate all shares, as it encourages other to give it a try! hi Larry… I suggest creating a small altar for your checks (sacred space with a crystal, candle etc) or you can use your sock drawer, wallet, or where ever your heart calls. Keep it simply or make it what ever feels right for you. I like keeping mine in a special spot (Altar) each month and then release then at the new full moon or an upcoming full moon. These are amazing! Please add me to your newsletter distribution list. Thank you in advance. your boon, so others will know what is possible! Thank you so much for sharing Precious! Your sharing helps other know the power of writing New Moon Checks! Glad it can help others. Erika… that is fabulous news! Thank you for sharing… all shares help others know what is possible! OOPS!!! I got so caught up in work that I forgot about the “Void Off Course” and wrote my checks Do I just rip those up and write new ones today? hi Erika… yes.. Actually, write the new checks now, since we are in an optimal time. Then hold the previous checks in one hand and the new checks in the other. Feel the difference between the two. Then release the checks written during the Void of Course. Well I found your page months ago during the fall. I starting to do my abundance checks. Just like you said, you don’t to believe it to works, it just happens. I purchase my first car (thanks to my mother) last February. My last payment would of been this fall. So I figure that I’ll have it paid off by this summer, by continuing to do the payments after planning on using my federal taxes. From day forward, a lot was going on with my car, from the engine light being on, car being vandalize twice with police report (I believe it was my ex boyfriend, long story on him) and etc. On my abundance checks I written one to pay off my car in full and the other to have some funds. Eleven days before Christmas, I was involved in a car accident. I was heading to work on a different route, traffic ahead of me slow down and I followed along. Next thing I know I was hit from behind! Thought I am in pain from my head down to my feel, I am thankful to be alive. I made sure that I said my prayers every time I got in my car. The car was totaled and by this week, it’ll be paid in full (I am going through the other insurance.) I had around $2800.00 to pay off. They send the remaining amount of $256.79 and they already sent me a check earlier for lost wages for around $900.00 I didn’t like how all off this happen but in a way it work out. Is it possible to write checks for money I “owe” to someone ? I had just finished writing my New Moon Abundance Cheque (tonight, February 14) and Im just realizing that the New Moon is actually tmrw! Also, thank-you for your website and showing others how to write these cheques! I have a Long Term Goal and I would love to use this Method. My goal is for 2020, How will this affect the disposal of the check? When do I dispose of it? 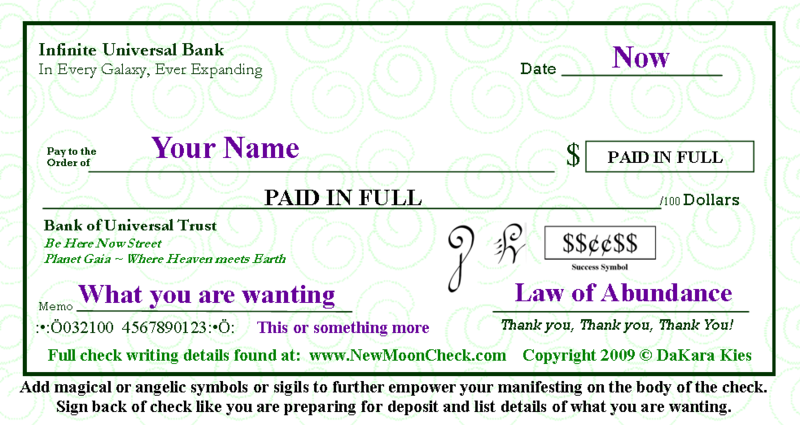 If I Dispose of it should I rewrite the check at every new moon again? If I do not dispose of it, where do I Keep it? In a place I can see every day/ on my person or do I hide it and forget about it? hi Sam… There are several options. Create a sacred space for the check… an altar or place you feel is sacred. It can be in plain site if you wish to bring the ‘goal’ to the forefront of your mind. Or it can be hidden. I would keep the check, unless you feel something and want to add an additional perspective to the check, which you can write a new one adding or release the first and write the new one. Go with the flow of the energy you are observing around the ‘goal’. First I want to thank you for your advice and help with the new moon checks, greatly appreciate it! I have a question, what happens if you don’t burn your checks on the full moon? I haven’t burned mine, I put them in a separate box. hi Jess… You can release/burn them at any upcoming Full Moon… Sometimes I hold mine for a few months (depending on what I wrote the check for) and then release when it feels like the right time. Can I write a new moon check now? Today is Sat May 19th… We are still in the first quarter of the New Moon energy… Meaning we are still in the influence and power of the New Moon. The Moon goes VOID OF COURSE starting at 2:14 pm PDT until 4:11 pm PDT.